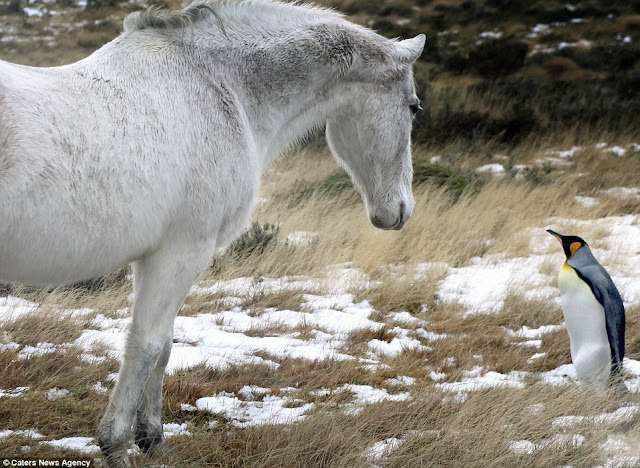 Nuzzling up together on the frosty ground in the Falkland Islands, this might seem like the most unlikely of friendships. 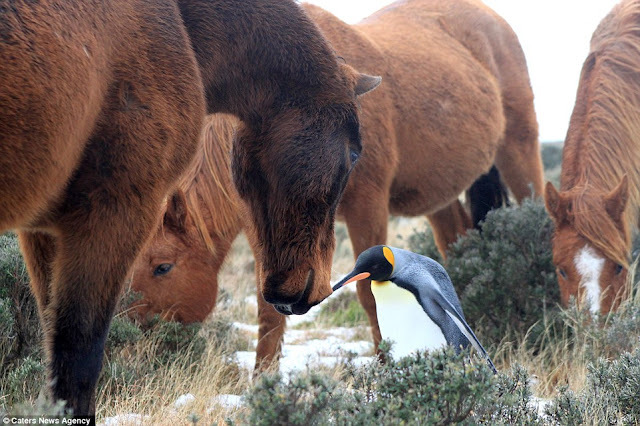 But this herd of horses took in a lonely penguin as one of their own and snuggled up with their curious new companion. They were also seen playfully chasing after the bird as it stretched out its wings and waddled along the white-topped turf. The horses also craned their necks and touched their noses with the penguin's beak in the heart-warming snaps. 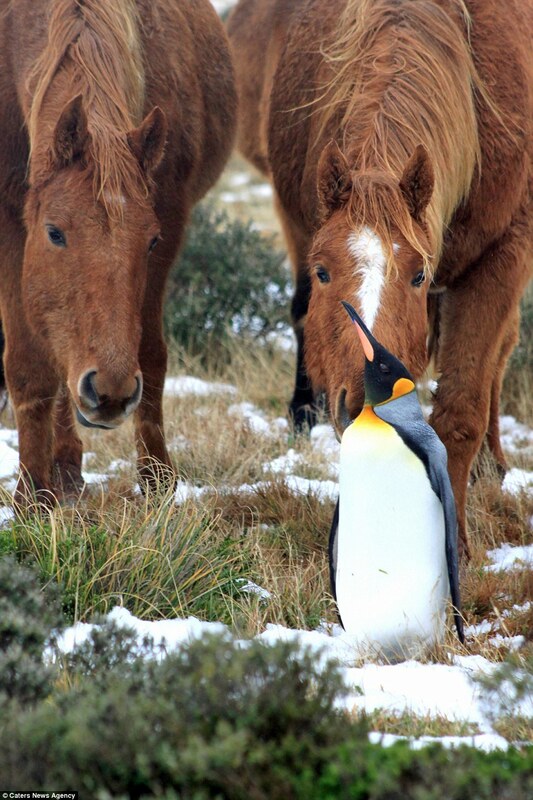 Sarah Crofts, of the Falklands Conservation group, took the pictures when she spotted the unusual alliance as she was feeding her three horses. They were taken at the Cape Pembrokeshire Nature Reserve, five miles outside of Stanley, the country's capital city. 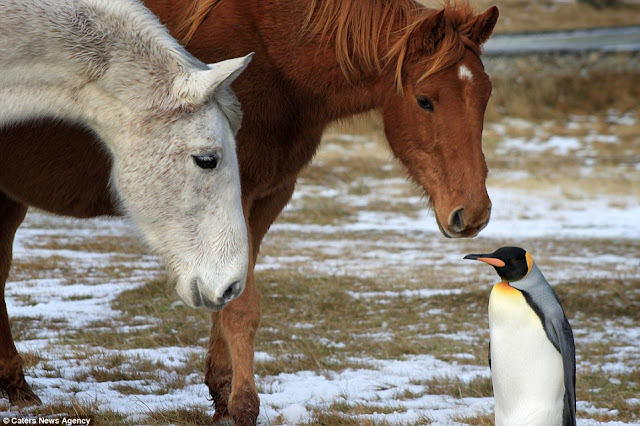 Responses to "Touching moment herd of horses adopt a lost penguin into their group (Photos)"
If only humans could get along like different breeds (and "colors") of animals...how sweet would that be? animals are better than humans - humans should LEARN from the animals! 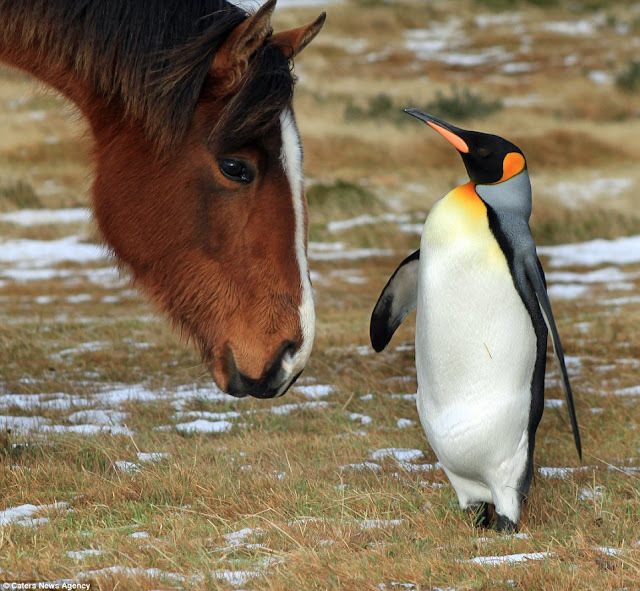 Well not to compare myself to a penguin, and this is a heart warming situation for this penguin, but I too have had a similar experience, so has many other people i'm sure. I've been taken in by my friend and his family. In fact there are still cultures around the world, thought they're rare, that shelter a person in need of a home and protection. It is truly a blessing to give and to receive in such an experience. Animals are constantly showing us how we should live. I hope more people wake up. I agree with Rudy. 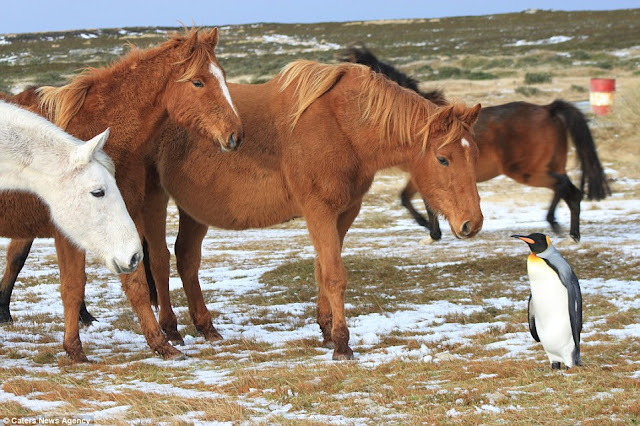 It's wonderful that the horses took in the penguin, but there are people who need to be acknowledge too. When I worked for the welfare department, I met so many people who took in people who weren't related to them. Mankind isn't always as bad as it seems. I agree with Rudy and anonymous about people taking in other people. I also worked in the welfare office and saw so many people take in people they weren't related to. I wish there was some way to let people know that there are great people out there, but maybe, they don't do it for acknowledgement. I wish all of us could learn more from inter-species friendships.